A mock cheque of the grand prize being held with pride by Datuk Dr Tan Chik Heok (centre), President of TAR UC while the students namely Lee Yweng Yan (third from left), Wong Fook Chin (third from right) and Isabelle Pong Wen-Xin (second from right) posing with their trophies accompanied by Ms Wong Hwa Kiong (rightmost), Dean of the Faculty of Accountancy, Finance and Business (‘FAFB’), Ms Yeo Liu Choo (second from left), Associate Dean of Department of Accountancy, FAFB and Mr Chuah Chin Leong (leftmost), Associate Dean, Department of Professional Accountancy, FAFB. Cha Chin Seng was not present when this photo was taken. 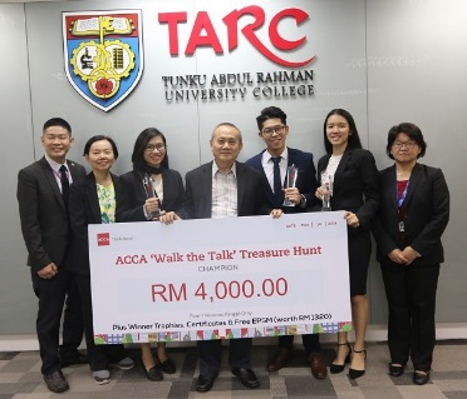 While coming with the intention of enjoying the fun and learning new things at the same time, TAR UC students gained more than what they wished for when they claimed the Champion spot in the Association of Chartered Certified Accountants (‘ACCA’) “Walk the Talk” Treasure Hunt 2018 beating 84 other participants from 21 other institutes of higher learning and employer partners of ACCA. The 6-hour treasure hunt was held on 14 May 2018 with the aim of creating awareness and understanding of its new Ethics and Professional Skills Module (‘EPSM’) which was launched in October 2017. TAR UC was represented by Lee Yweng Yan and Wong Fook Chin who are studying the Bachelor of Commerce (Hons) as well as Isabelle Pong Wen-Xin and Cha Chin Seng who have recently graduated from TAR UC with the Bachelor of Commerce (Hons). For Isabelle and Chin Seng, the reason behind their participation in the treasure hunt was to experience the fun in learning EPSM. “We were attracted by the approach taken by ACCA to enhance the awareness of EPSM through a treasure hunt. As Chin Seng and I have completed the older module which is the Professional Ethics Module (‘PEM’), we also wanted to find out what are the differences between the old and new modules. And it was a decision I did not regret as we had a lot of fun and excitement in completing all the hurdles in the treasure hunt,” Isabelle recalled. The treasure hunt was divided into 6 stations which represented the 6 units contained in the EPSM followed by the final round of solving a quiz. “All of us enjoyed completing each challenge in the 6 stations. We found the challenge in the fourth station quite difficult but at the same time exciting. The challenge required us to reach for a box which was placed in the middle of a circle and we were not allowed to touch any area in the circle. It was truly a tough challenge and we even got penalised once. However, we did not give up and we worked closely as a team to discuss possible ways to retrieve the box. The adrenaline rush to come up with the best way to get the box was very mentally stimulating for us to attempt the subsequent hurdles and ultimately win the treasure hunt,” Yweng Yan claimed. As the Champion team, the students took home RM4,000 cash prize, individual trophies as well as exemption of the EPSM course fee amounting to £60 for each student.